As part of our continuing series on how to get your dining room Thanksgiving ready, today we focus on finding the right chair for your dining room. With the hundreds of options available through James Craig Furnishings, you are sure to not only find the right style for your home, but you can customize the smallest details to make sure the seat fits you like Goldilocks. There are so many options when it comes to dining chair/table combos that it can be hard to choose. Fortunately, the team at James Craig Furnishings can help you pick just the right style. Visit our Washington Ave showroom in Houston to test drive a few models and work with our team to choose the perfect design. Our immense selection of dining chairs include offerings from Dinec, Saloom, Stanley, Vanguard, Lee Industries, Brownstone, Sam Moore and many more. And our in-store experts can help you choose the right upholstery, leather, trim and other details to finish your seats in style. You: a lover of rustic style. Your dining room table: rustic farm table. Your chair: the Belmont Dining Chair from Brownstone. Fall has almost come to Houston but we’re not waiting! Just one more week for our October special … then it is gone with the wind. BE INSPIRED! Stop by Lee Industries’ Lifestyle Slider here. Then, get the look! Stop by our showroom and order yours before November 1 for a 20% discount! Need more of a reason to fall in love with Lee? They have a commitment to the environment. That’s why they offer “innovatively styled, bio-based upholstery as their standard.” But moreso, they have a commitment to quality. Lee only uses steel coil springs in their eight-way hand-tied seat decks. This keeps your springs from shifting and creating those uncomfortable lumps. Each spring is supported by polypropylene and steel strapping to provide the most long lasting and comfortable seating known to man. More? Their frames are certified, select kiln-dried hardwoods. The joints are double-doweled and every corner is blocked, screwed and glued. That means that your furniture will not creak, sag, split or warp … no matter what. Picky McPickerson? With more than 1000 fabrics and 80 leathers to choose from, Lee can sate even the finickiest of designers. They also have a long track record of eco-friendly manufacturing, using naturalLEE soy-based cushions, certified frames, recycled filling for pillows, water based stains, and offer many organic and natural fabrics. They reuse or recycle approximately 95% of all the materials that enter the production stream. 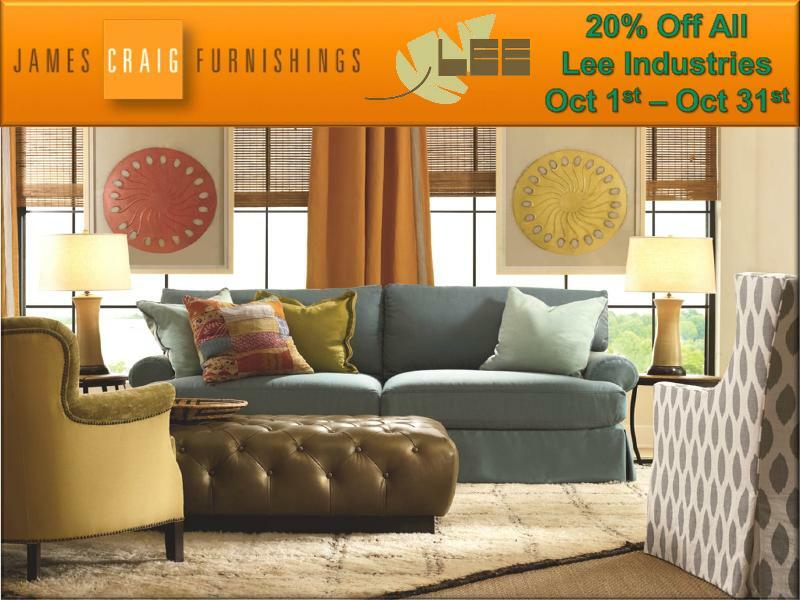 … and LEE is made in the USA by craftsmen that are experts in their field and take pride in their workmanship. Stop by our showroom. We’re happy to answer any questions. We love Lee but this deal won’t last. Stop by the showroom this weekend and take advantage of 20% before it’s gone! Visit our showroom at 4500 Washington Ave. in the Historic Heights. Like us on facebook. See everything we offer at our website.